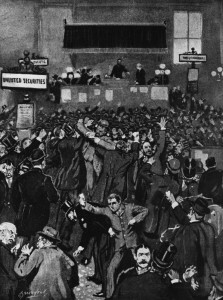 There is an irony to a solar eclipse that occurred at 0 degree Capricorn (government, regulations, commerce) in 1889 that led to the silver panic of 1893 where the rip cord was pulled on the stock market and people made a run on the banks to exchange their silver notes for gold. The event plunged the nation into a severe depression. The irony is an eclipse exactly opposite in 2001 at 0 degree Cancer (silver, the security of the nation) that led to the attacks on September 11th and the rip cord being pulled again on the market beginning April 2008. Total solar eclipses are very powerful events. The Sun, the ruler of our solar system, sets a mandate or a theme based on the sign and degree that occurs at the peak of the eclipse. The path of the eclipse is also important. A total eclipse will create a “rent” or a “dent” at the degree it occurred just waiting to be triggered by another planet when it falls into that degree. This can be either positive or negative depending upon the nature of the eclipse. The 0 degree cardinal cross (Capricorn, Cancer, Aries, Libra) is very significant. In mundane astrology it is the axis of power for nations concerning war, money trends, actions and initiative. 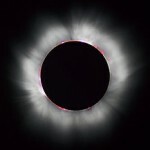 Solar eclipses are very rare in the 0 degree of a cardinal sign. They are so rare that no eclipses fell into a 0 degree cardinal sign in the entire 20th century. However there was an eclipse at 0 degree Capricorn December 22, 1889. Saturn is the ruler of Capricorn and also rules gold. Capricorn is associated with government, laws that are restrictive, national calamities, business affairs, and has a diminishing effect. The historic total eclipse at 0 degree Capricorn December 22, 1889. This eclipse was the hand writing on the wall regarding the value silver and gold. The south node conjoining the eclipse and opposing the US Venus at 3 degrees Cancer (silver, wealth, and the security of the people) was the “rent” that when the planet Mars in it’s fourth pass to the point of the eclipse triggered the Silver Panic and stock market selling that plunged the nation into a deep depression. The Silver Panic was the result of the U.S. being out of step with the rest of the world regarding the values set for gold and silver. The Sherman Silver Act 1890 created a bi-metalic monetary standard and set the price at 16:1. It was one of the few times in history where there was “price inflation” due to an expansion of precious metals backing the currency. The miners were happy and the farmers were happy as it enabled them to pay off their debts. The bankers’ had two major objections to silver coinage. Silver coinage expanded the monetary base (inflation) impacting negatively the bonds, dominated in dollars and held by the banks. The type of inflation was occurring outside of the bankers’ control. You will at once retire one –third of your circulation and call in one-half of your loans. 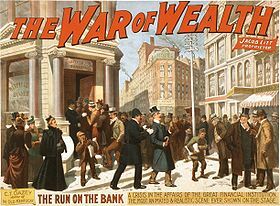 After this you are to advocate an extra session of congress to repeal the purchasing clause of the Sherman Law, and act with other banks of your city to push for it’s unconditional repeal…The future of national banks…depends upon immediate action, as there is an increasing sentiment of…silver coinage. This was the final push over the edge for silver as people made a run on the banks to redeem their silver for gold. This led to a depletion of the gold reserves in the U.S. Treasury. Ironically in order to keep the Treasury solvent The United States had to borrow 3.5 million ounces of gold from J.P. Morgan (JPM) and spoiled the game speculators had been playing on the chances of a Treasury default. I hope my readers are seeing the parallels. A bizarre reversal from 1893 where it is now J.P. Morgan who could be at risk of default with a massive short position in silver. And potentially a default of the Treasury? Will the Federal Reserve bail them out? Take a look at the astrology. The reason silver took the hit in 1893 had a lot to do with the effects of the 0 degree Capricorn eclipse opposing the Venus, which meant a government controlled diminishment of value for the metal that would effect the wealth and security of the people. The eclipsed Sun in conjunction with the south node meant the nation would also have to cough up it’s gold and suffer a major financial set back. Now let’s look at the eclipse of June 21, 2001. The eclipsed Sun at 0 degree Cancer (rules silver) conjoin the north node 6 degrees is beneficial and not diminishing. The north node conjoin the Sun denotes a change in recognition of a positive sort followed by some initial stress and tension. The eclipse was also conjoin Jupiter in Gemini which suggests new laws (possibly also an alli foreign nation adopting silver coinage) with far reaching consequences putting into place silver coinage. Remember the 0 degree Cancer point is a trigger. It really got triggered when Pluto hit 0 degree Capricorn (remember diminishing) and made a harsh opposition to 0 degree Cancer in April 2008. This was the rip cord on the recent crash that ended March 2009 and also wrecked havoc on gold and silver, putting stress on the confidence in the metals. Another major trigger just occurred June 13th 2011 when Hades hit 0 degree Cancer for the first time in 360+ years. In Greek astrology Hades rules the 2nd house of banking and minerals from the earth and will reinforce the positive influence of the eclipse on a larger scale where now large financial institutions will play a role in silver coinage that is positive for the people. As for J.P. Morgan we will have to wait and see, however in the Fed chart the 2001 eclipse was opposite the Fed Sun and conjoin the south node…and remember, the U.S. Treasury had to cough it up with south node/eclipsed Sun in 1893. Here are the dates to watch for movements in silver. July 11th could be very positive for silver and gold. July 22nd could also see a very positive move in silver. China Restrictions Coming for Rare Earth Stocks?